An artist's depiction of the SPHEREx mission at work. That's thanks to a newly approved mission called Spectro-Photometer for the History of the Universe, Epoch of Reionization and Ices Explorer and nicknamed SPHEREx. The instrument is designed to tackle two key questions: how the universe evolved and how common some crucial building blocks of life are across our galaxy. "I'm really excited about this new mission," NASA Administrator Jim Bridenstine said in a statement. "Not only does it expand the United States' powerful fleet of space-based missions dedicated to uncovering the mysteries of the universe, it is a critical part of a balanced science program that includes missions of various sizes." The SPHEREx instrument will be able to gather optical and near-infrared light from a mind-bogglingly large number of sources: more than 100 million stars in the Milky Way itself and more than 300 million other galaxies. It will manage to tackle two different but equally fundamental questions in those two different purviews. All told, SPHEREx will scan through the whole sky and gather data in 96 different wavelengths of light. Within our Milky Way galaxy, SPHEREx will map water and organic molecules, which are both fundamental ingredients for life as we know it. And beyond our galaxy, it will look back into the very first moments of our universe. 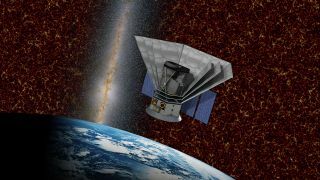 Scientists will be able to use its data to prioritize observing targets for other future space telescope missions, including the James Webb Space Telescope and the Wide Field Infrared Survey Telescope. "This amazing mission will be a treasure trove of unique data for astronomers," Thomas Zurbuchen, associate administrator for NASA's Science Mission Directorate, said in the same statement. "It will deliver an unprecedented galactic map containing 'fingerprints' from the first moments in the universe's history. And we'll have new clues to one of the greatest mysteries in science: What made the universe expand so quickly less than a nanosecond after the big bang?" SPHEREx is slated for launch in 2023, is designed to last two years and budgeted to cost $242 million, not including launch costs.